It happens every so often: out of the inbounds pass, someone, whether Jose Calderon, Langston Galloway or another person whose legal job description is “playing basketball,” will jog up the court, turn, see a 7’3″ Latvian who can’t legally drink in the United States and hurl a pass in his general direction above the crest of the three-point line, like someone lazily tossing a frisbee forehand. Upon surveying his amicably deserted surroundings, the young giant will hoist a shot, hold his still developing form and, much to the delight of damn near anyone who is lucky enough to be present no matter the arena, watch his effort sail through the rim, as easily as depositing a letter in a mailbox. 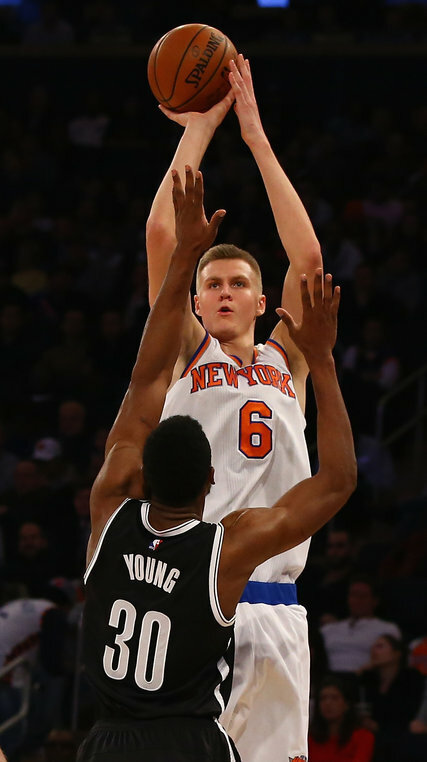 61 times this season, Knicks fans have been able to watch Kristaps Porzingis hit a three, often like the above. Of course, that isn’t all he can do; if it was, he would be less a folk hero and more a disproportionate (and less accurate) Steve Novak. And if it was, you’d like to think, the Knicks would not have spent their fourth overall pick in last summer’s draft on the Latvian wunderkind, the only first rounder New York has until 2018. Instead, Porzingis has shown flashes of being an all-around dynamo, making his selection at number four seem like a George Clooney-masterminded, Steven Soderbergh-directed heist. In today’s NBA, potential is as valuable, more or less, as life itself, for without it a team may as well spend its winter and early spring evenings brushing up on political rhetoric, the latest developments in gravitational waves and carpentry. At the same time, potential unfulfilled becomes something like Confederate currency, a misplaced investment in a convincing-at-the-time-but-ultimately-half-baked idea. Given the two clear sides of the coin, it takes a certain leap of faith to expend a team’s only draft pick in years on an underweight, untested Eastern European prospect in the Spanish league, which, while formidable, is a leisurely jog through the neighborhood compared to the marathon of the NBA. Labels were all over Porzingis prior to the draft, the vast majority of them terribly unflattering. For a league in which Jason Collins can become the first openly gay professional athlete in the four major North American sports, the NBA still struggles with identity politics and geographical implications. To be a white European still implies softness, despite the best efforts of players like Dražen Petrović and Dirk Nowitzki. 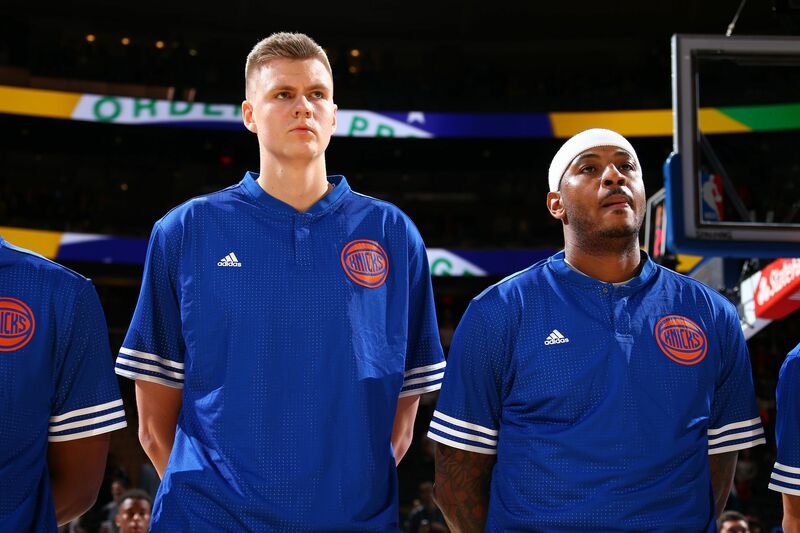 It is the latter to whom Porzingis is most often compared, at times unfairly. Sure, Porzingis can shoot well, from distance and around the rim. He’s actually putting down threes at a better rate as of this writing (34.9%) than Dirk did in his rookie season (20.9%), though Nowitzki shot from three only 68 times. He may already be the best in the NBA at the putback dunk, which he seems to do a few times each game, springing out of the darkness and through a few hapless defenders to return the ball to its rightful home. More than a cursory overview of the league’s current state, however, may yield a more apt comparison. On the left coast, Golden State’s Draymond Green has made himself an All-Star by being a master, not simply a jack, of all trades, as Paul Flannery pointed out earlier this week in his excellent profile of the Michigan State product for SB Nation. What makes Green’s rise so exceptional is that he is the unique unprecedented player for his size and skill set. A second round pick in 2012 following a stellar college career, no team could fathom that the doughy Green would eventually become perhaps the NBA’s best team defender and one of its best all-around players on both ends of the floor. Comparing Porzingis to Green right now is premature almost to the point of sacrilege, but then, so was the notion of Green being a key starter for a championship team once upon a time. Porzingis’ size and skill set have never come quite in these amounts in the same player. Both are relatively slow-footed defenders who recover quickly and remain engaged on that end of the floor. Each is confident in his ability to withstand the pressure of his more lauded teammates, his problematic coaches° and the media while wholeheartedly embracing his fans, no matter when they converted. As purely unparalleled athletic specimens, it wouldn’t be difficult to imagine Porzingis following a Dray-like trajectory to stardom. The city which formerly belonged to a mild, billionaire mayor is witnessing the rise of a foreign crowned prince, himself soon to be none too light in the wallet. Whether Phil Jackson, or whomever succeeds him as figurehead of the James Dolan Manifest Destiny of Mediocrity¹, is capable of surrounding Porzingis with complementary pieces, which the Knicks have largely been unable to do for Anthony, remains to be seen. For their part, Anthony and Porzingis seem to have gelled, a rare act of geniality for an aging All-Star and a suddenly more-popular rookie. New York fans, and basketball fans everywhere, are now compelled to their own leap of faith. ¹A proclamation which, curiously, does not currently seem to include Glen Sather’s New York Rangers, who also love them some Kristaps.